Heidelberg, 27th March 2018 – The American dental company Young Innovations is presenting its product range at numerous European trade fairs and is also offering many articles at a special price. For the prophylactic series Young Dental and Zooby®, attractive starter kits are available: when buying three boxes with Young Disposable Prophy contra-angles, you receive a Young Proxeo handpiece for free. 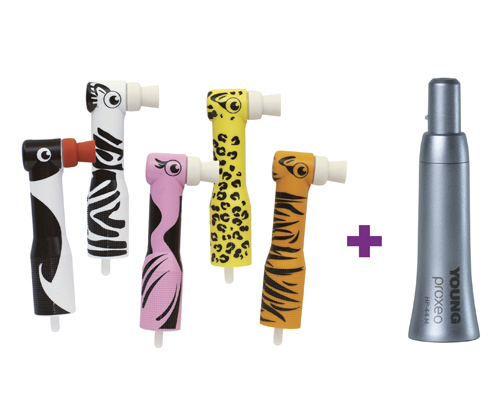 Customers who purchase a pack of Zooby® disposable Prophy contra-angles receive the same handpiece. Practices can also test the products with a loan hand piece and a sample package of Young or Zooby® DPAs. Young Dental is the world's leading supplier of polishing systems and disposable Prophy contra-angles, with decades of expertise and experience in this field. The latest generation of contra-angles has a particularly narrow design and a small, round head. As a result, tooth polishing is much more pleasant for patients and the practitioner reaches regions that were previously barely accessible. The DPAs are available in either a straight version or a contra-angle version with an ergonomic 17 degree angulation to reduce muscle fatigue. The ergonomic, low-vibration handpiece protects the hand and joints. The polishing cups are made of the company's special rubber that adapts precisely to the tooth's contour. This avoids splatter and achieves an optimal result. Young Prophy Cups and the associated polishing pastes are currently also on offer. All products can be ordered through retailers and at www.youngdental.eu.